Some people are good at sports and some are good at singing. Some are good at maths and some are good at painting. My skill is not at all impressive, but very useful. I'm really good at sleeping. I can sleep pretty much any where at any time. I've slept in a banged up taxi in India (during rush hour) and I've slept standing against a wall at a night club (no, I wasn't drunk). I especially love sleeping while being transported. My personal record is 12 hours straight in a car. I even sleep well when flying. I've done 8 hour sleeps on several intercontinental flights. But a few days ago, I tried something new. I fell asleep at a music festival. While I have done that many times before this time was different. It was pouring rain. But I felt tired and it was between acts so I laid down on our vinyl table cloth I brought to sit on, pulled up the zipper, pulled down the hood and took a nap. A 10 minute power nap was exactly what I needed and I woke up just in time for the next performer. As I said, it's not an impressive skill but it really is useful. It's done! I've registered for my first run, ever! It's the San Francisco Fire Fighters toy run, "Run Wild for a Child". It's charity run in San Francisco's Golden Gate Park (and the Panhandle) on Thanksgiving Sunday. You can run 5 kilometers or 10 kilometers. If you don't want to run but still want to support the cause, you can walk the 5 kilometers as well. You can dress up as your favorite toy and you're encouraged to bring new and unwrapped toys and all the proceeds goes towards San Francisco Fire Fighters holiday toy program. The distance I'm running (read jogging) is 5 kilometers. I guess for some people 5 kilometers (3,1 miles) is nothing but a warm-up. But to me, it's an achievement. 5 kilometers is my Everest. I'm definitely not a runner. I'm out of shape, I'm chubby and my legs are really short (they dangle off most chairs). But the idea of running has always intrigued me. People who do it seem to really enjoy it and there is an ease to "going out for a quick run" that is very alluring. Will I ever be that person? I would say it is very doubtful. This far I've found running quite painful and frustrating, but worst of all, it's so boring. But I will test my patience and stay hopeful, it has to get better with time. And I still have a bit of time. So, if you want to see a chubby Scandinasian climb her Everest, you should join me in my endeavors. In the end of the day, it's for a very good cause. I heart movies. Really I do. It doesn't really matter what genre of movie, it can be block-busters, rom-coms, dramas, comedies or action movies. I've also seen my fair share of "critically acclaimed foreign movies". As long as I'm entertained and I feel that a movie is worth while, I'm happy. So, here is my latest movie recommendation: Jackass 3D. It was totally awesome! I don't care that the movie is moronic, juvenile and disgusting, it's so frigging entertaining. It's been true throughout the ages, people like seeing other people hurt themselves. You can call it Charlie Chaplin slapstick or America's Funniest Home Videos, the concept is pretty much the same. So, if you're anything like me and enjoy laughing uncomfortably hard, see Jackass 3D! I'm proud to be a part of the Google clan. 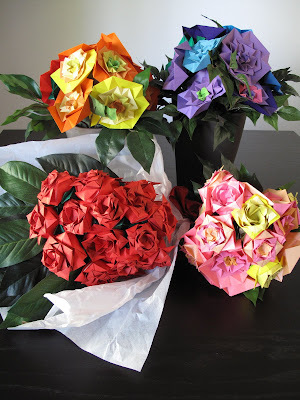 52 origami flowers, one for each week we've been married (a labour of love that took about 40 hours to complete). It all begun in 2007. Back then I was commuting every week between Trelleborg and Göteborg, a commute that took 5-3 hours each way, depending on mode of transport. I was usually on the train about 4 hours every Friday and Sunday. To assist me in my travels, my husband bought me a Nintendo DS. This was my introduction to gaming. I never gamed as a child, not because I wasn't given the opportunity, but because I wasn't interested (and because I'm a REALLY poor loser). About 5 months later, I bought a Nintendo Wii for my husband's 30th birthday. Perfect! I had one portable gaming device just for me and we had a gaming console we could use together. We enjoyed it immensely and we played it frequently. About another 6 month later we bought our first Playstation 3. It was mostly because my husband wanted one and at first I found the PS3 games somewhat intimidating (with the exception of Singstar). So he had our PS3 in our Göteborg apartment while I moved the Nintendo Wii to the apartment where I stayed during the weeks. In 2008 we moved to the US. We sold the consoles we had in Sweden and we bought new ones when we arrived the US. We bought our tv and our gaming consoles within weeks of arriving while we didn't get a bed until two month later (yes, we slept on our bedroom floor). After playing Little Big Planet I warmed up to the PS3 and my first completed game I ever played by my self was Grand Theft Auto 4, which is still my all time favorite game. The PS3 and the Nintendo Wii lived happily next to each other. We played Nintendo Wii together and the PS3 individually. Sure, we play Wii Fit individually and we've played a few co-op games on our PS3, but this is, pretty much, still how we do things. However, about a month ago something changed. Enter Playstation Move. Playstation Move gives you the same freedom to mimic the actual actions as Nintendo Wii does. It includes a camera, new hand remotes and a Playstation Move sports game. It covered pretty much the same sports as Wii Sports so it was difficult not to compare. Wii sports has a whole lot more sports, but the PS3 itself is a stronger console so the games are better looking and more complex and with the camera, the remotes are more sensitive. The only thing I miss in the PS3 version is the ability to create your own avatar. Without going into detail, the verdict is pretty obvious. Since we got Playstation Move, we haven't touched the Nintendo Wii. I predict that we will eventually go back to using the Wii, but only when we want to play games that require the balance board. But regardless of what, I will continue to support Nintendo. My Nintendo DS is not retiring any time soon. A few days ago I was at the doctor's office getting my weekly allergy shots. To make sure I don't over-react to the medication I need to wait 30 minutes after the shot so they can assess my reaction. This gives me 30 minutes to read People's Magazine every week. This weeks headline was " Deadly Bullying" and it covered the story about Tyler Clementi who killed himself after being outed by his college room mate as being gay. It also featured Phoebe Prince who took her own life after being bullied at school. I can't even begin to express the sorrow I feel when I think of all the lives wasted as a result of bullying. Not only the lives that ends but the lives that are crushed and scars that never heal. There are no tell tale reasons why someone is bullied. It can be race, size, sexual preference, glasses, braces, pimples, cloths, hair, accent, rumors, disabilities etc. The list goes on and on. Most often the reason is: just because. In People's magazine there was an article about how you can tell if your child is bullied. They stress the importance of communication, trust and reassurance. While it is very important for parents, family, friends and teachers to be aware and to be educated on the subject, it is only one side of the problem. Why is there no guidelines to help parents, family, friends and teachers to identify a bully. What if it's your child that is making someone 's life a living hell. What if it's your child that is responsible for someone ending their life? Maybe you would be heartbroken if you found out your child is a bully. Maybe you will never think of your child as a bully and excuse the behavior as teasing and friendly banter, simply kids being kids. Or maybe you child is a bully because you don't care at all. I'm not sure how we should stop bullying. But I know we should never stop trying and I know we need to address the bullied as well as the bullies. We also need to remember everyone in between. If your child is neither bullied or a bully they still have a responsibility. I get that it is difficult to muster enough curage to break up a fight, but a smile or a compassionate glance is a start and it is no more difficult than being human. Today, the Norwegian Nobel Price Committee announced the recipient of this years Nobel Peace Prize. They have awarded Liu Xiaobo, currently a political prisoner in China. The motivation was: "for his long and non-violent struggle for fundamental human rights in China". For this decision, I thank the Committee. When President Barack Obama won the Peace Prize last year, many were skeptical (me included). The discussions that followed were not about peace or unifying greatness, but about fairness and political power. However, this year, I believe all of humanity who believes in democracy and freedom from oppression are and will be celebrating Liu Xiaobo. Liu Xiaobo has been fighting for human rights and freedom in China for the past 20 years. He knew what he wanted and he was never afraid to take the road less travelled. The passion and conviction in combination with intellect and academic excellency gave him a powerful and international platform to stand on. But even with a promising career in the US he never forgot where he came from. He stood on Tiananmen Square alongside other freedom lovers and for that he was jailed. But that didn't stop him. He continued his non-violent march to make China a democracy. He is now serving his forth term in prison and is scheduled to be released in 2020. Needless to say, the Chinese Government is furious! The Chinese Foreign Ministry issued an official statement saying: "The Nobel Peace Prize is meant to award individuals who promote international harmony and friendship, peace and disarmament. Liu Xiaobo is a criminal who has been sentenced by Chinese judicial departments for violating Chinese law. Awarding the peace to Liu runs completely counter to the principle of the award and is also a desecration of the Peace Prize." Some might speculate on how this peace prize will affect Chinese-Norwegian relations, how this will affect Chinese policies, for the better or worse and ultimately how this will affect Liu Xiaobo. But one thing is for sure, all of these concerns were already in the minds of the Norwegian Nobel Prize Committee when they made their decision. I applaud them for their choice. A man like Liu Xiaobo deserves our global and unified support. Is this Europe as we know it? "Let me in" is the American remake of the Swedish book "Let the right one in" (Låt den rätte komma in) by John Ajvide Lindqvist. I haven't read the book but I have seen the Swedish movie version. It is always difficult to write a review on a remake. Should you compare with the original? Or treat it as an isolated movie? A few questions I have to answer before giving a my opinion. One could argue that if you are going to do something that's already done, you better do it better. While this might be true in many cases I don't necessarily think this needs to be true when making a remake. Of course it's desirable, but there are other reasons that can motivate a remake. A broader audience can be one. This is often linked to language. The USA is the biggest producer of movies in the world. Even though there are plenty of Bollywood movies out there, there is really no comparison when success is measured in box office numbers. The formula is really simple. A good movie is made in a foreign language (or British English, such as "Death at a funeral") and is proven to be successful. Rewrite the script and add some "Hollywood flair" (and Hollywood actors) and launch it as a Hollywood production. Then wait and hope the movie will be a success and make tons of money. How big is the language impact? I'm not surprised that I enjoyed the Swedish version more than the American version. Swedish is my first language and I assume I understand the subtle nuances better even though my English is fluent. But then there are many other movies where I don't understand the original language at all, but still found them better than the English remake. This leads me to the final question I posed earlier. Will I always think the original is better than the "copy"? I've looked through an extensive list over remakes and I can't find a single movie where I preferred the remake. So, do I intrinsically prefere the originals or am I just more intrigued by other perspectives than the Hollywood one? Don't get me wrong, some of my favorite movies are big Hollywood productions, but maybe we should put more effort in promoting the already good originals rather than remake and relaunch. But on the other hand, I believe many people prefere the remakes because they are usually more accessible. And if there was no audience, there would not be a market for remakes. Let's go back to discussing "Let me in". This movie is essentially a coming of age, vampire movie. But it has very little in common with Twilight and True Blood. You don't need to be a teenager or vampire fan to enjoy this movie. It's mostly about relationships, emotional struggle and a very lonely vampire. And the remake aspect of it? I was pleasantly surprised. They stayed pretty true to the esthetics of the original movie. They invited Swedish producers. The plot is still great and the casting was mindful. I will still recommend the original before the remake, but for those who choose to see the remake, they will have a great movie experience. I bet all of us have, at least, one item of clothing that has past its expiry date. There are plenty of reasons to hang on to something. It can be sentimental reasons, or the "you-liked-it-when-you-bought-it-and-you-still-do-but-you-don't-know-when-to-ear-it" reason or my personal favorite, the "you-hope-you-will-fit back-into-it" reason. I have all the above in my wardrobe. But the most frustrating reason to hang on to something is when you have something sooooo comfortable and you simply can't find a replacement. For me, this most often applies to shoes, although not exclusively. The dilemma: you don't know how comfortable shoes are until you've worn them a while. By the time they peek in comfort you really don't want to wear anything else. But then they become too worn so you need to replace them. By the time you reach this point they are no longer at the store where you bought them and you will end up spending time and money on finding a replacement. And there will be many disappointments along the way. And along they way, the original item is still in the closet, along side it's uncomfortable imitators. Like many others, I love shoes! A pair of shoes can be a work of art. I've had love affairs with many of my shoes. Some of them I've admired from a distance. They've been gorgeous, exiting, unpredictable and fueled my imagination. But more then once, they have left me hurt, in pain, bleeding and sometimes in tears. It will always start of being beautiful but somewhere along the way things will begin to change. Not really noticeable at first. You deny the uncomfortable feeling growing inside and when people around you (aka husband) question your choices you will defend yourself and give every excuse you can think of and you will be dead afraid that people around you can read the doubt in your face. But eventually everything will start to fall apart. You will surrender and promise yourself never to make the same mistake again. But then, maybe it will be different the next time, with another pair of shoes. I've made enough mistakes, I've learnt my lesson. Maybe they are not as exquisite, or not as beautiful, but they are comforting, they give you freedom to run, jump, skip and they will never hurt you. In fact, they are good for you. I'm no longer having affairs, I'm in a long term relationship with my flats. I'm won't deny that I'm tempted, at times, to relaps, but I soon come to my senses when I step out of my comfortable flats to try on a pair of heels. Nowadays I'm an avid user of flats of different kind and when I want some hight I usually opt for wedges. I have plenty of sneakers, sandals and cotton lace ups. I enjoy changing things up so I have a multitude of shapes and colors. But recently I found something new. I think I've found the shoes of my life. TOMS! I've seen them around. I've tried them on. I've thought about buying them quite a few times. But $50 and up for a pair of cotton slip ons seemed a bit steep. I knew that TOMS had a admirable mission, to provide shoes for people in underdeveloped areas. For every pair you buy they will donate a pair. I decided to order a pair. Oh boy, am I glad I did! They arrived a few weeks ago and since then I've worn them in Las Vegas, trekking around in Grand Canyon, to sports events and as dress shoes going out. I love them! They have replaced all other shoes I have. I literally want to wear them all the time! I know this pair will be the first pair of many. If you want to do your feet a favor, try a pair of TOMS. Three things to remember, the material stretch to fit your foot, so they should feel a bit tight when you try them on. Also, to make sure your purchase will contribute towards TOMS mission, buy the shoes directly from them (www.toms.com). The online price (inkl. shipping) is about the same as the retail price. Last but not least, enjoy!